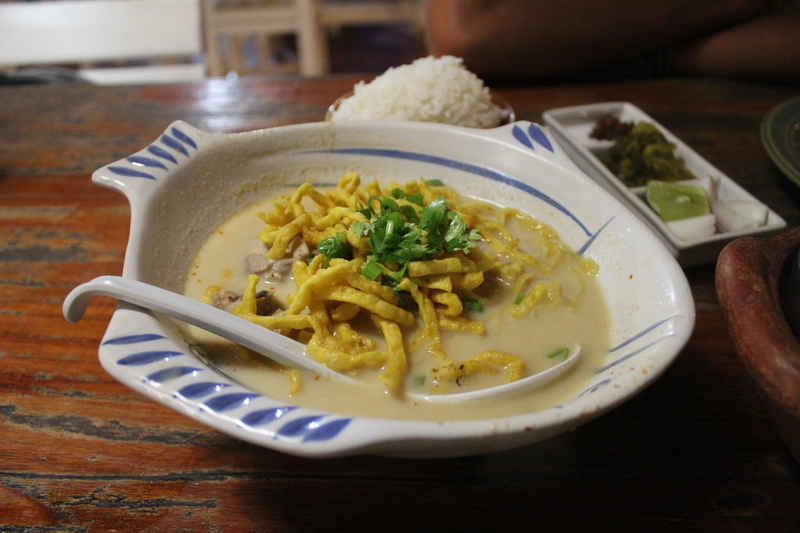 Khao Soi, fried noodle with curry soup, is one of the most popular food in Northern Thailand. You will probably hear a lot about it during your adventure in North. Of course each bowl is different and divert. Some are spicy, and others are not. They often have different types of noodles. 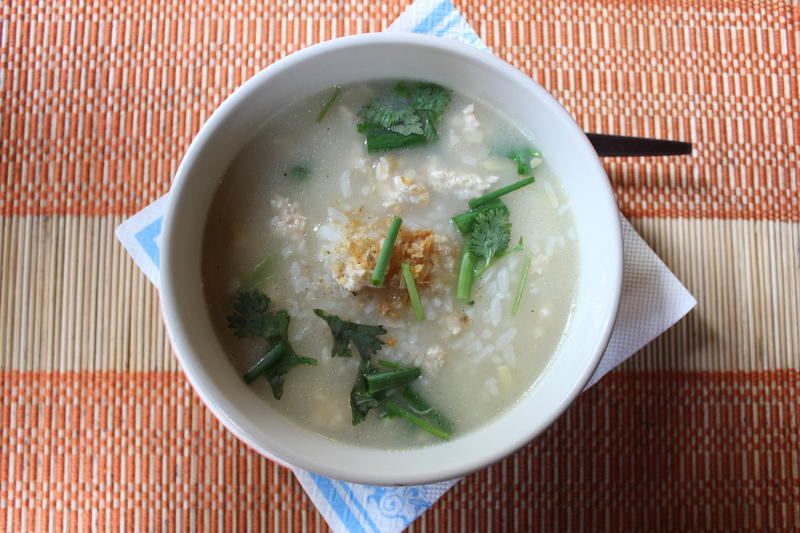 Among all those Khao Sois, this one is my personal favorite. Just a few minutes walk from the golden clocktower in Chiang Rai in main street, there’s this restaurant called “Barrab”. Covered with dark brown wooden wall and tables, the place has a modern atmosphere, not like other local restaurant with simple chair and tables. Sitting in front of the table, I noticed so many different kinds of bills and coins from around the world under the table glass, seemed this restaurant is popular among travelers. With a bottle of Chang beer in a hand, we enjoyed our meal. Every time I chew sausages I taste different vegetables and meat, and I liked the little bit of spiciness from black peppers. They went so well with beers, couldn’t stop tasting them together. Also the curry was good. I was craving beef since I didn’t have it for a long time, so I savored it with curry soup. It was a little spicy for me, but was really good at the same time. Home-made sausages are one of my favorite food in north. I often saw street vendors selling them, and they were variety of kinds. If you have any chance to come up north, I recommend you to try one of them. You may or may not find your favorite! In northern Thailand, there are a lot of Burmese refugees who create their own communities and spread their cultures, so you can find many Burmese restaurant around. 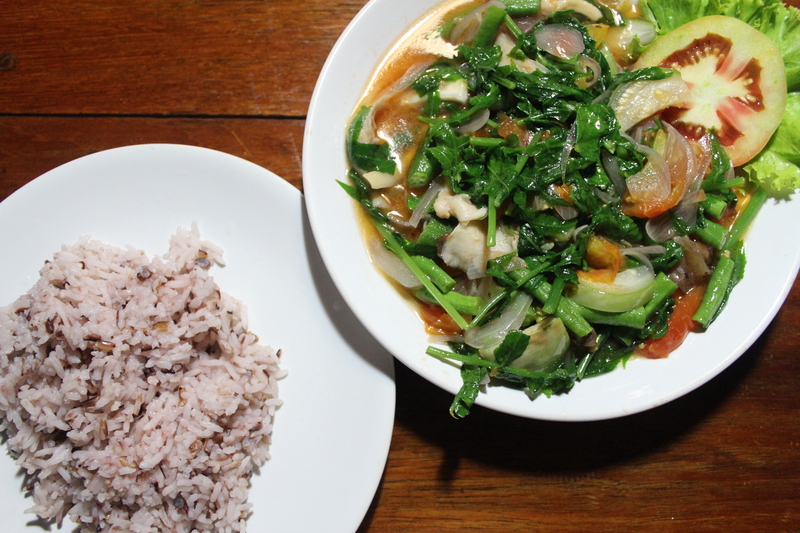 Before I came to northern Thailand, I had never had Burmese food before, but now I love it. Although it is not Thai food, it’s now a part of culture in Thailand, and you will find so many of them in cities up north. The restaurant was right beside the pond in the city. 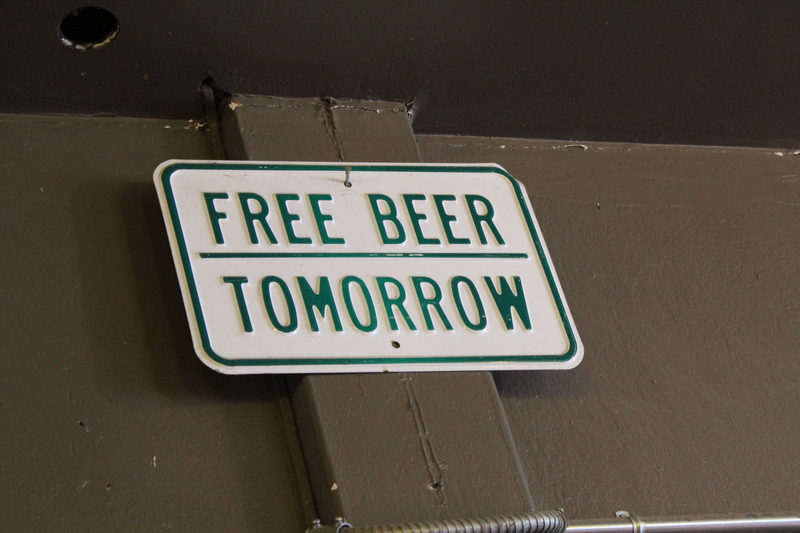 There was a wooden sign in front so it was easy to find. 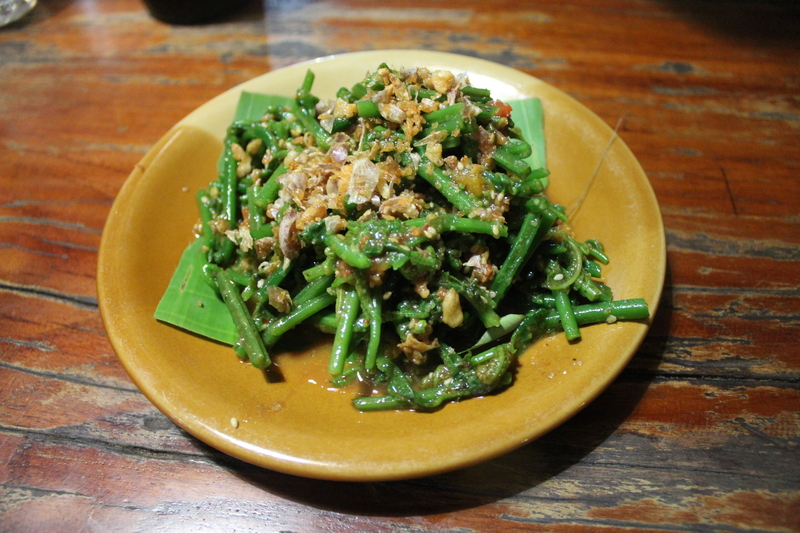 We picked Burmese Green Tea Salad as recommended on the Lonely Planet, and Vegetable curry. 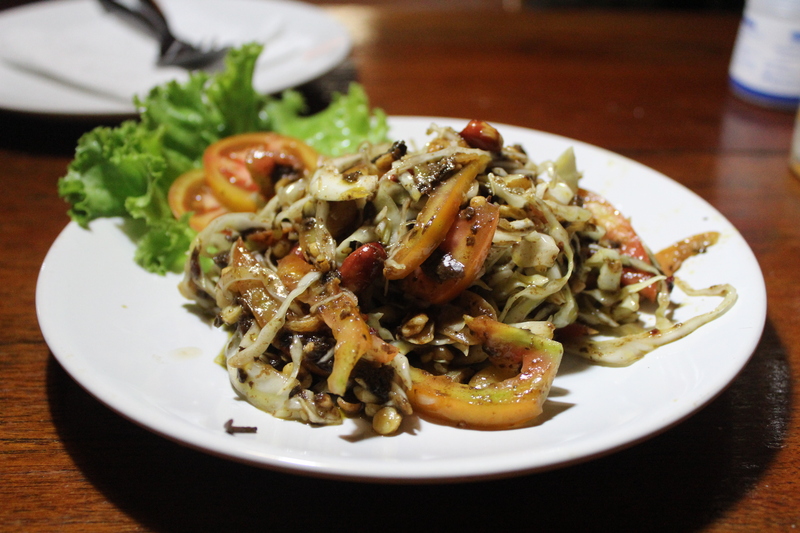 Burmese Salad tastes both sweet and salty with peanuts, tomatoes and garlic, and I really liked the combination. Vegetable curry was mild but the taste of all the vegetables soaked in the soup, and it goes so well with rice with mixed grains. Overall my first experience of Burmese food turned out great. I will definitely try more in the future. 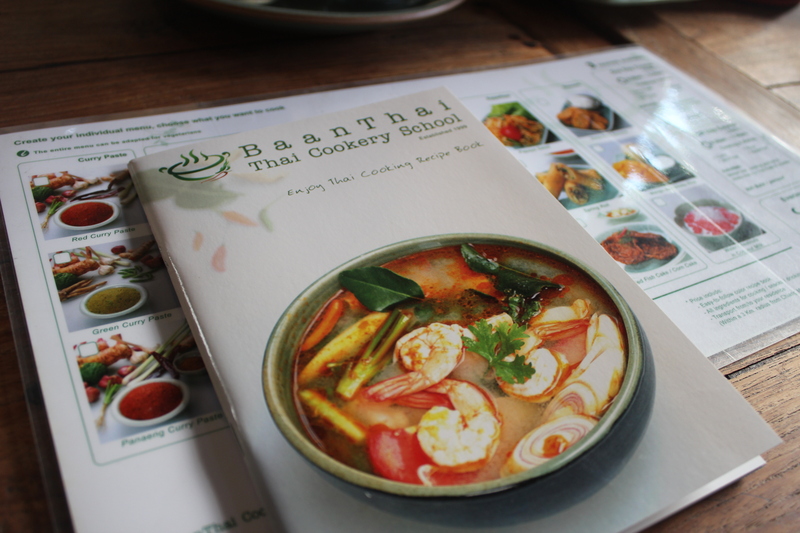 One of the things you should do in Thailand is to take a cooking class. 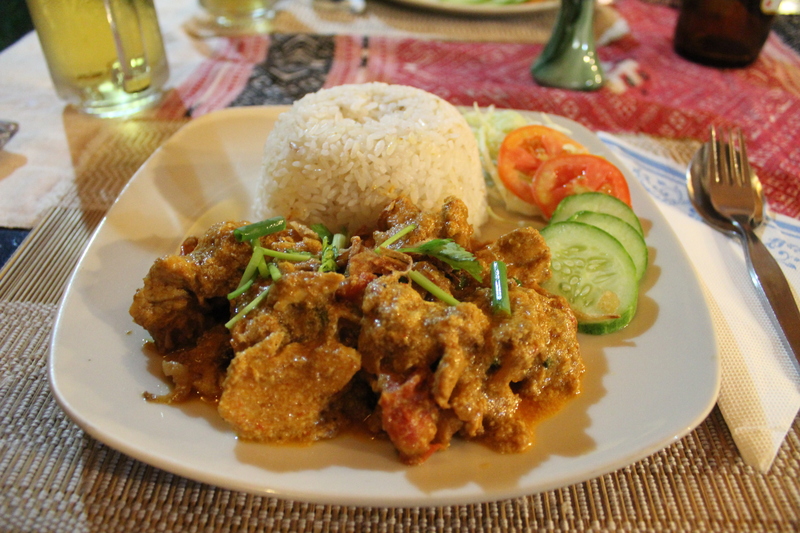 You can learn how Thai food is cooked and will be more familiar with ingredients. But most of all, you will be able to cook them at home, which I really wanted to do, because I knew I was going to miss all the delicious food in Thailand. We booked a cooking course online, and a staff picked us up at our hostel. There were 8 people in our group, including the ones from U.S., Germany, and Taiwan. 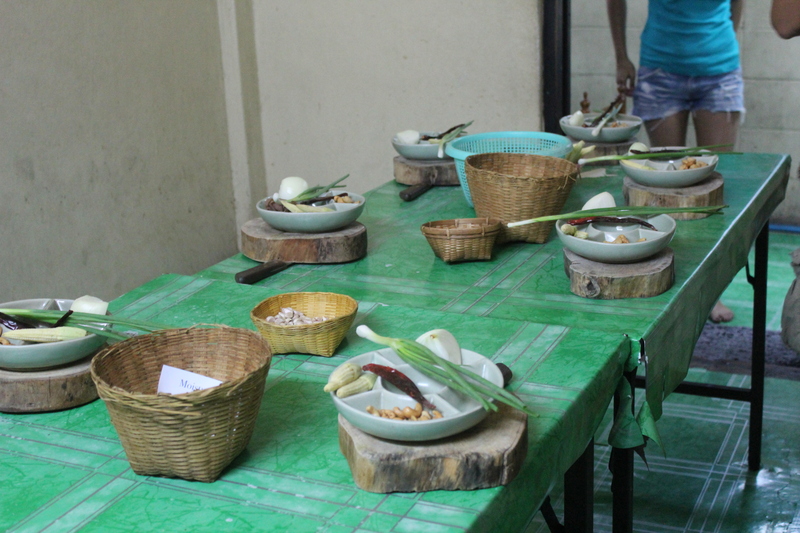 First we went to a local market close to the cookery school, and our teacher taught us names of different kinds of ingredients, and how they are used in dishes according to each occasion. After we came back from the market, we chose dishes we wanted to cook. 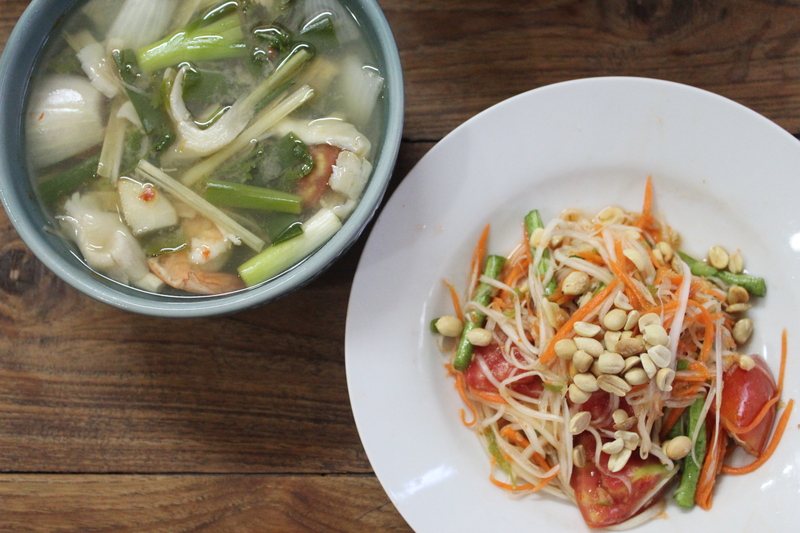 These are 3 dishes in each section: main dish, soup, salad, and curry, and we picked up Chicken Cashew Nut, Tom Yum Kung, Som Tam, and Paneng Curry. We stood in front of the cooking table, and started chopping ingredients. We put all of them in one plate, and moved to the different room where we actually cook. 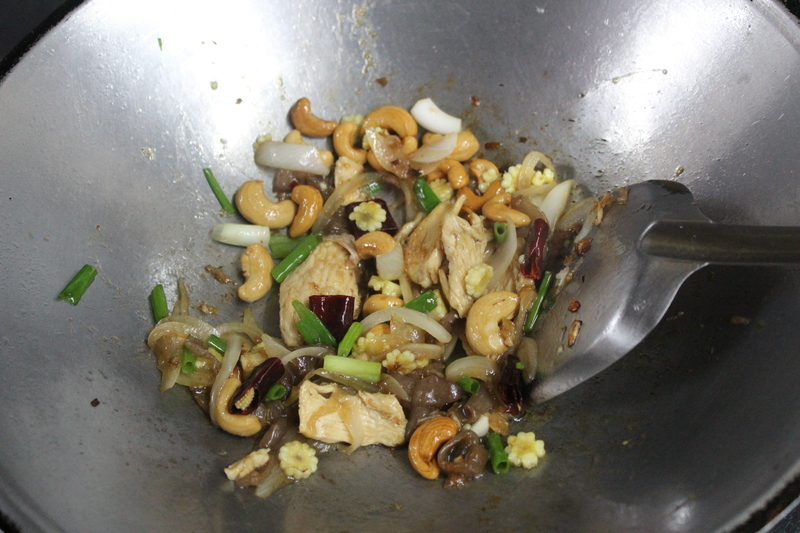 Before we throw them into Wok (pan) with fish sauce, oyster sauce and other seasonings, teacher showed us how to do it. It was pretty easy, and didn’t even take 10 minutes to finish up. After all of the dishes were cooked, we set out table and tried them. Some of them were really good, and others were missing something, but we knew what we needed to do to make them better. I realized, cooking delicious Thai food is somehow miracle, since with about 10 minutes of cooking, a little more or less seasoning can change everything. That’s why there are so many different kind of tastes in one particular dish, and we always try to seek the one we like the most. 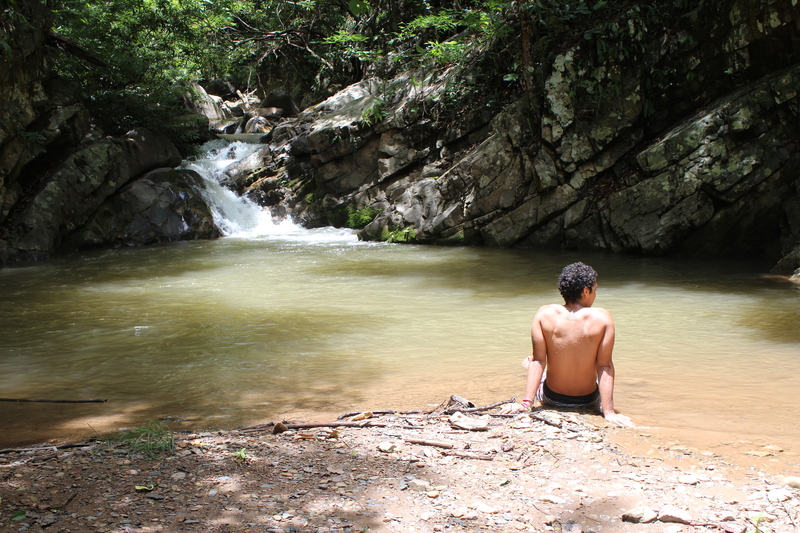 In a beautiful northern city of Thailand, Mae Hong Son, my boyfriend and I decided to go trekking. We booked a 2 day tour at Sunflower Cafe Tour, by the big pond in the middle of the city. Our guide named Pordy, who has been trekking more than 30 years. Turned out it was 10 hour trek in total, but we decided to give it a go. When I first imagine trekking, there is a little path on the way and we walk listening to wind or birds singing, as I’ve done a couple of times in Thailand. But for this time, it wasn’t that easy, and not just hard either. There was absolutely no path at all on our way. Pordy handed a stick so he can slap weed down and make a path for us as he walks. We walked along the river, inside the river, climbing slippery rocks blocking our way, walking up and down on a steep mountain, hiking on the edge of the cliff, looking right beside us far away down, and fighting with our fears to fall… after 6 hours of crossing many mountains, we finally arrived and we are all in drenching sweat and exhausted. We took a quick shower after we arrived, and it was time for dinner. 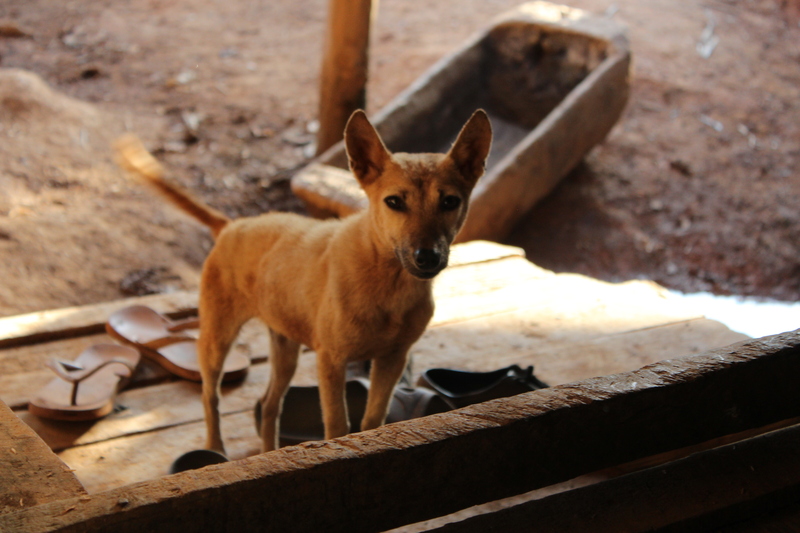 There were only three people living in the village and all of them cooked dinner for us. 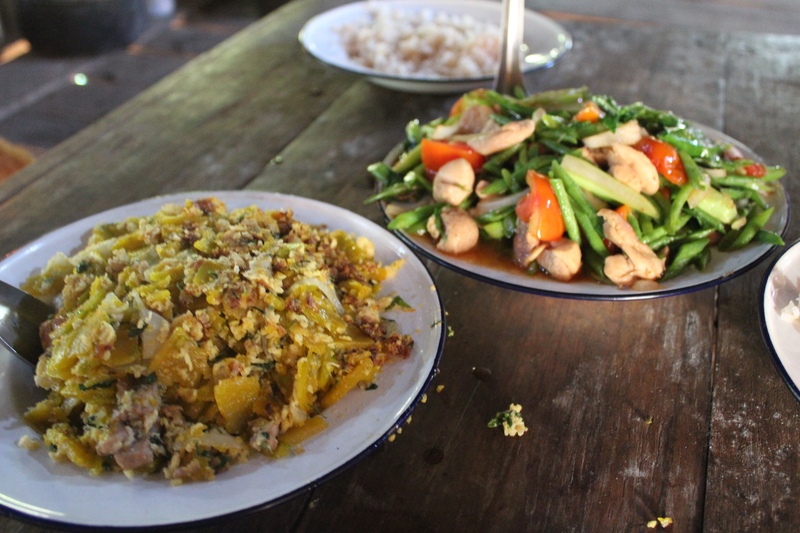 We had some stir-fried pumpkins, chicken and vegetables, and lizard soup, which Pordy got from his friend on the way. 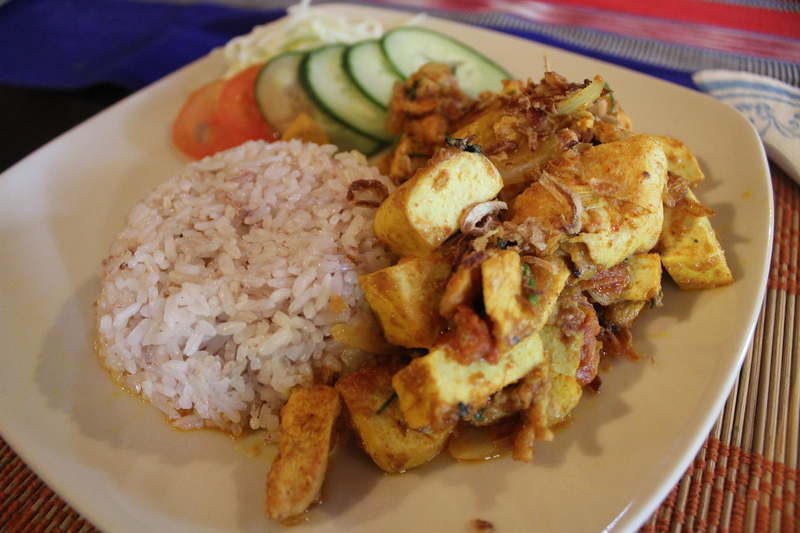 With subtle fish sauce taste and the combination of the ingredients, the food was so good. I didn’t have any idea how they get some spices and sources since they always live in the village, but they managed to cook deliciously. I think it was worth the tough trekking. Northern Thailand is famous for delicious food generally, but now I’m assured that it’s true. 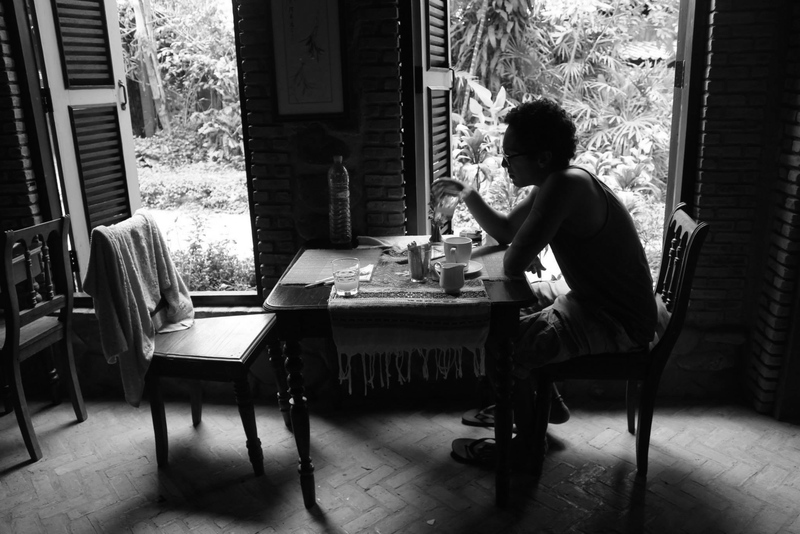 During our scooter trip around Northern Thailand, my boyfriend and I found a guesthouse in a small town, Pang Mapha (Sop Pong), on the way to Pai from Mae Hong Song. The place was in the middle of nowhere, where no tourist is around. We were driving the road noticing local gas stations aside, and all of a sudden, we found the place. 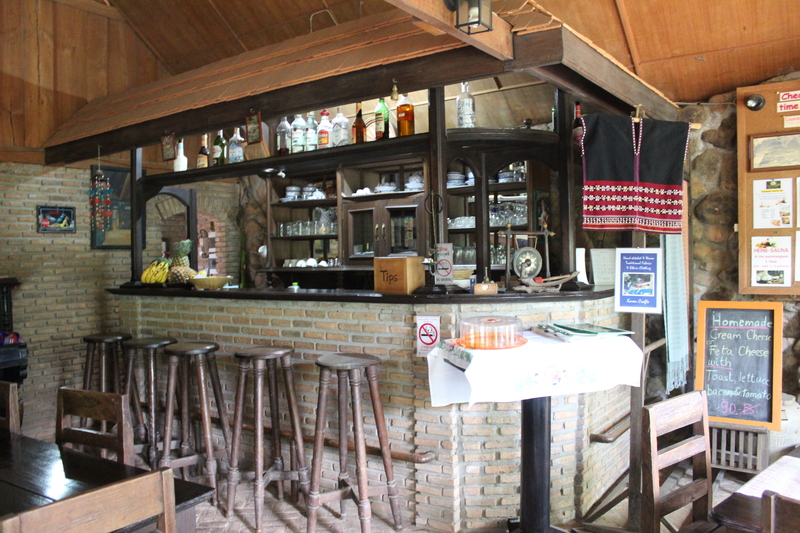 It was owned by Thai lady and her Dutch husband, so the rooms and bungalows looked European themed. The Thai owner cooks all the food in here. 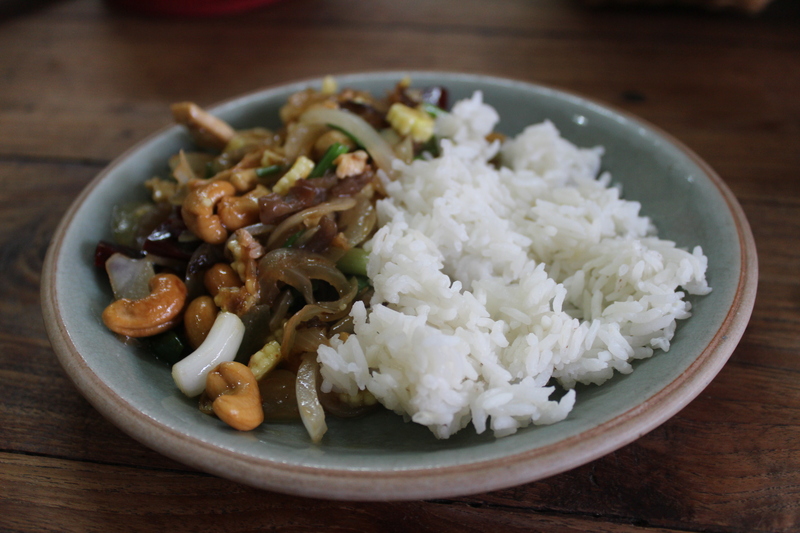 When I first tried the dish, I was shocked because it was so delicious, more than any of the dishes I had in the past 10 months living in Thailand. Maybe because I was starved, but something was totally different. I was wondering what makes them so good, and I noticed there were corianders in almost every dishes. When it comes to coriander, I personally don’t like it. Coriander alone has a strong flavor and can change the whole plate into a different one. But as with other spices and herbs, it makes the best. Mixed with other flavors, I didn’t even noticed there were corianders in it. I just felt a lot of different tastes in my mouth, and it was so delicious. There are not only dishes on the menu the Thai lady cooks, but also home-made fudge brownies and carrot cakes. Unfortunately, I didn’t have time to try them last time, but if you have any chance to drop by, let me know how it goes!